For realtors, having clients who might make only a one-time real estate purchase, or who you might not hear from for years, the on-going hunt for prospective clients is all the more important. And let’s be honest. There are only so many pens, fridge magnets and business cards to hand out before your potential client pool is less than enthused by your messaging. But it’s not all bad news. 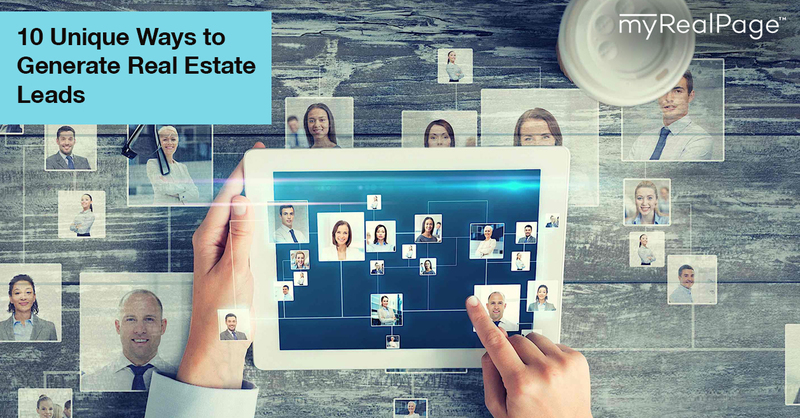 Here are 10 ways you can take action today to generate new leads for your real estate business. Create an Adwords account and experiment with the Search and Display options for your business by creating ads. For example, you might want to target a specific type of property (say, “bungalows) in your particular neighborhood, or perhaps try displaying your ads on partner websites related only to “DIY home renovations.” The possibilities of combinations to experiment with are endless, and Google even offers free study guides to learn all about the placement of ads and best practices. The self-described “front page of the Internet” is more than just a forum for funny memes, viral videos and Internet trolls. It’s also an amazing community full of engaged users talking about niche and not-so niche topics. Get in on some of the real estate related groups, but don’t forget – you can be “downvoted” if all you’re doing is advertising. Another great community of engaged users congregating around one subject can be found on Facebook. Join local community groups and get to know the moderators and top commenters. Most of these groups need approval to get accepted and are heavily moderated so do not position yourself commercially, but rather as a community member or expert in your field. Remember to give value via your comments and interactions, and be sure that your public Facebook profile is up to snuff for when lurkers come by to check you out. Maybe you prefer real-life interactions? You are in the service industry, afterall! Meetup.com is a great place to find events in your area to attend with like-minded people of similar interests. Find an interest that applies to you personally or with your business professionally and take it from there. Who knows who you might meet? This one may seem strange, but there’s a link between having pets and purchasing homes. Offer to sponsor an event at the animal shelter or if you’re inclined to volunteer, spend some of your time there. You may be catching some new pet owners (and potentially new homeowners) at a critical time. One great way to gain exposure for your business is to position yourself as an expert in your field. This means offering your services or expertise for free to journalists, radio shows and television news reports. Although you may be thinking that you don’t know any “media” people, it can be as simple as joining a public Facebook post or commenting at the bottom of online news articles. There are various Twitter talks happening at any time and offering your voice in industry-related discussions is a unique way to get some exposure. These talks usually have a start and end time set up, as well as a topic, hashtag and moderator. Just make sure you get the okay from the group first, although some talks encourage wide participation! Don’t know where to start? How about searching #TwitterTalks on Twitter? One of the biggest draws of a new home is the neighbourhood that it’s situated in. Take time to visit the local cafes, restaurants and parks in the areas you represent, then write reviews on Yelp, Google Reviews and TripAdvisor about your experiences. Not only will you be growing your online presence, but that knowledge will be handy to share with your potential clients, as well. Pre-print some branded postcards with your company info and postage stamps, and gift them to your client. You’ll spread word of your business and besides, who doesn’t love personalized mail? Sure, an open house is an opportunity to see a home, but it’s also a great time for new people to meet you. Whether it’s welcoming people with a small complimentary treat (anything that smells delicious is a bonus) or decorating the open house sign with some eye-catching balloons, enhancing the open house experience is a great way to sell yourself and the home.